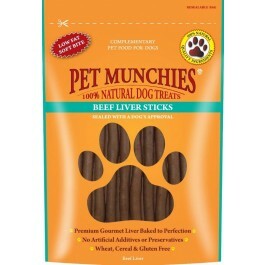 Pet Munchies Beef Liver Sticks are superior premium gourmet treats made with quality, human grade real meat. Delicious, Nutritious and Wholesome… all made with 100% Natural, human grade meat, just like nature made them, with natural textures, flavours and exceptional palatability dogs love. “Tasty and Delicious”, suitable for dogs of all sizes, and perfect for pups from four months old. Naturally low in fat with no artificial colours, additives, preservatives or flavours. Liver treats are ideal for training purposes as most dogs genuinely love the taste. Great source of protein, vitamins, good fatty acids and many other minerals and nutrients. Plus, they are the perfect size and texture for any dog and cats love them too! Just break into smaller pieces for toy breed dogs and cats. Even Senior dogs with tender gums can enjoy these treats.